The Bus Association of Victoria (BusVic) has ‘nervously agreed’ to a bus lane sharing trial with motorcycles on Melbourne’s busy Hoddle Street which started this week. The trial allows motorcycles and bicycles to share the southbound bus lane with buses during morning peak hour in Hoddle Street – a notoriously congested artery in Melbourne’s inner-east. The trial was instigated by the Victorian Automobile Chamber of Commerce (VACC) with support from Victoria’s Transport Minister Terry Mulder, and will run for six months and monitored by VicRoads. 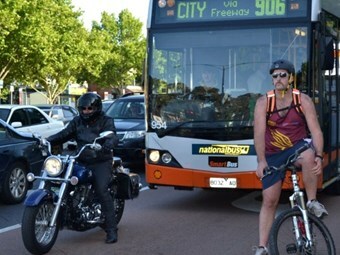 VACC expects the trial to succeed and will push for widespread adoption of motorcycle use in bus lanes across Melbourne, while the bus industry takes the opposing view that light vehicles have no place in heavy vehicle mass transit lanes. BusVic Executive Director Chris Lowe says his association agreed to the trial on the basis of its research value. "We nervously agreed to the trial, and we did that because if you want to have good policy it’s got to be underpinned by sound research," he says. "But we are hoping it does not conclude that motorcycles and buses should share the same road space." Lowe says motorcycles and buses should not be sharing the same road space. "Bus lanes are an on-road priority measure for mass transit," he says. "Motorcycles don’t need any on-road priority." Lowe is concerned that the trial may lead to incidents on Hoddle Street. "The south bound lane of Hoddle Street is extremely busy and heavily congested with a bus stop every 400 metres," he says. "If motorcycles are in that lane they too will be stopping behind the bus, and we are very nervous about it." Lowe explains that all commuter buses travelling in the Hoddle Street bus lane are fitted with cameras. "If there is an incident it will be recorded, but we remain nervous about the trial because we don’t want an incident," he says. "Motorcycles are light vehicles, whereas buses are 16 to 18 tonne heavy vehicles, and God forbid in an incident I know which one is going to come off second best." Lowe says the Victorian Government should be giving more on-road priority to mass transit. "In terms of giving priority to motorcycles, it’s not needed," he says. "There are too many people with longer travel times that need to be given priority and they are the people who use the public transport network." VACC Executive Director David Purchase believes motorcycle and scooter riders are entitled to share Melbourne’s bus lanes. "This initiative provides benefits to all road users," he says. "On the evidence so far, this trial will relieve pressure on one of our busiest roads, significantly reducing congestion and helping to reduce the State’s road toll." Purchase also called on the Victorian Government to spread the policy to other parts of Melbourne. "If, as I suspect they will be, the findings are positive, we will advocate for motorcycles and scooters to be permitted to use the Hoddle Street southbound bus lane on a permanent basis," he says. "We will then also call for more bus lane locations to be made available to powered two wheelers."